As I settled into my spot under the tent on that first morning of Adaptive Handgun One, I looked around at who my fellow classmates would be. We ranged from active-duty military and law enforcement, to college students, businessmen, two artists and a princess (you know who you are and you know I love you!) and a handful of women students. Our age range began in the early twenties, and I'm proud to say ended with me, at nearly 60. But age, rank and position in the business world didn't matter here. We were all there to become our personal best. Then the men we had come to learn from arrived, and we began a three-day journey that would expand our minds and our skills. But first, just in case you aren't aware of who our instructors were, let's get that out of the way by listing their official creds. Travis Haley is a veteran Force Reconnaissance Marine with 15 years of dedicated real world experience including: combat tours in the Middle East, Africa and Central Asia. He also served as a special operations and security contractor before partnering with Magpul as founder and CEO of their training division, Magpul Dynamics; and as CEO of the parent company, Magpul Industries. Travis then left the company and developed his own enterprise, Haley Strategic Partners. Ron Avery has consistently ranked among the best shooters in the world, winning events in national, international, and world championship competitions; he is currently USPSA Grand Master in Open and Limited divisions. But he is so much more; he is a veteran deputy sheriff, police officer and valedictorian of two police academies, along with having spent 30 years as a professional trainer and consultant to all branches of the military, select government agencies, hundreds of federal, state, county and municipal law enforcement agencies and countless clients in the private sector. So to say that our instructors are the best in their field, is quite an understatement. 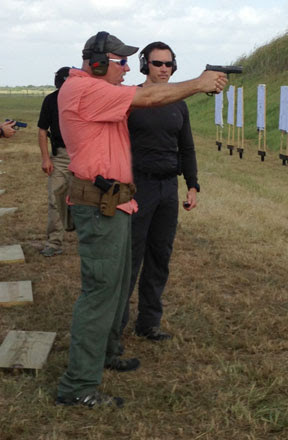 If you have ever taken a gun training class from Travis Haley, then you know it's more than just learning how to point and shoot correctly. You will not only learn more than you thought you ever could about how to handle your gun, but also how to handle your life. So as I recount the high points of my three-day voyage towards becoming a more accurate shooter, think about how these exercises can apply to your total life experience. And I say "high points", because this post would be endless if I discussed everything I absorbed. To begin with, you will notice that our class was titled "Adaptive Handgun". 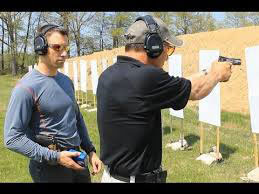 Travis was able to combine his three fundamental principles of handgun shooting (Feel, Eyes, and Finger) with Ron's scientific principles of biomechanics to give us a whole new perspective on how to properly shoot a pistol. I have taken several pistol training classes over the last few years, but for the first time ever, I was introduced to the concept that shooting my pistol is a process of reactive responses to the shooting cycle. Everyone in the class knew the basic principles of shooting: Get your grip; see your target; get sight alignment and sight picture; when you're ready to take your shot, squeeze the trigger consistently; let the gun go off. But the genius of this class was the breakdown of those processes into specific steps, and then assessing and adapting our failure points in order to get the success we want. Doesn't that work in life, too? No matter what your path is in life, doesn't success come from adapting our procedures/methods/systems, as we prioritize our risks? 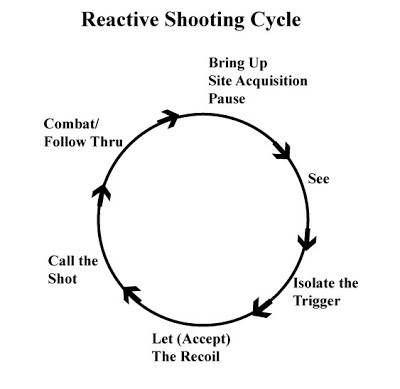 If I try to describe to you the steps we took to break down the shooting cycle, it will sound far too simplistic. But that was the beauty of this class... we were taught how to break down the cycle, discover our failure points, and modify them until we could successfully repeat them. We had to develop a plan in our mind on how we were going to accomplish our goal, be able to identify where our cycle broke down and fix it. All this was achieved with deliberate practice. And practice we did! Each step was repeated twenty-five, fifty, a hundred times; as we were reminded that "repetition ... mindful and purposeful repetition ... builds good habits, which encourages problem-solving." Are you able to see the benefits of applying these principles to your entire life? It's about assessment and moving forward. As you assess the point at which you failed (whether on the shooting range or in your life), you can make adjustments, gain control of each situation, and move on to the next step (and the next) until you are able to calmly and consistently achieve your objective with precision and accuracy. We didn't do anything fancy or aggressive or dynamic; it was all fundamentals -- stance, proper grip, sight alignment/picture, trigger control, accepting the recoil, picturing where the sight settled after the shot, and follow through (let the bullet leave the gun and hold). We built a good solid foundation on which to improve our skills through mindful and deliberate practice. At the end of our class, we were asked to assess ourselves, and I have to say that after listening to 24 of my fellow classmates, it pretty much came down to grip (which was related to recoil management) and trigger control (which correlated to accuracy). It may sound like a cliché, but after three days in the sweltering heat, and countless repetitive drills, I now know that "practice will make perfect" .... if you just dedicate the time and develop the mindset. As I told you in Friday's post, those three days had a profound effect on me. I not only look at the art of shooting from a different perspective, but my attitude about life has advanced to a new level. Travis and Ron showed me how to look at things differently. They encouraged us to apply these principles to every facet of our existence. This life is short and we are responsible for making it what we want it to be ... no excuses and no giving up. We need to go about our lives intentionally and with purpose. We need to listen, pay attention and figure out where and why our processes are failing; and then be tenacious in fixing the problem. We need to always be willing to learn something new. Remaining static and institutionalized, rather than open and imaginative, is the fastest way to being passed by in life. They warned us to never become complacent; to always reach for the next rung. With an ability to assess, modify and repeat until successful, we can count on accomplishing any goal. Re-read that last paragraph ... these two men transferred a lot of knowledge to us in three short days; knowledge that was derived from their life experiences. Travis developed a little catch-phrase during our class time on the range; one that sums up the results of putting our training to use .... when you are able to assess and adapt, success will follow. And I don't think I'll ever forget his voice in my head: "If you will do these things ... It's like magic!" sounds like an excellent class. i'm looking forward to a marksmanship class i'm taking at the end of this month---> the appleseed project---teaching me to become a better marksman. definitely need the practice! Practice is the key, along with the proper instruction. But most of all .... have fun!